Build a library of common and non-trivial queries in a central location. Locate read/write intensive queries inside the database server for maximum performance. WSAD V5 with PTF1 and Service Upgrade 5.0.0.2.
db2 => update dbm cfg using JDK11_PATH "c:\Program Files\SQLLIB\java\java12\jdk"
Note: If the JDK path has space in it, run the update command from a db2 command prompt as shown above. You will get an error message if you run it from the DOS prompt. We have not tested this tutorial with DB2 8.1 yet. A few things already look different for DB2 8.1. For example, the JDK path configuration variable name is JDK_PATH and not JDK11_PATH. Also, DB2 8.1 installs JDK1.3. This tutorial uses the SAMPLE DB2 database. 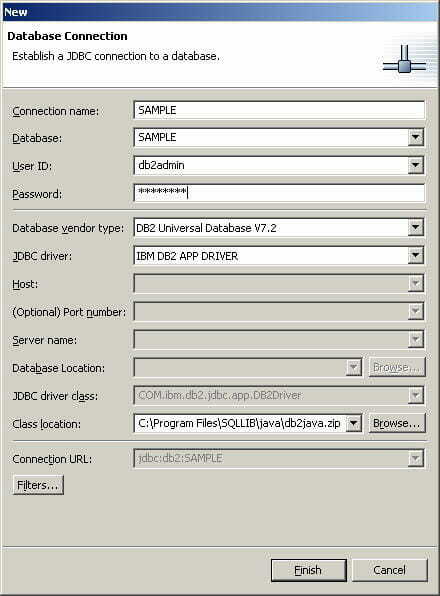 Create the database by running the db2sampl command or from the First Steps GUI. Make sure that you can connect to the database. Launch WSAD. Decide where do you want to create the stored procedure. We recommend creating a simple Java project to hold all of your stored procedures. This project can later be exported as a JAR file and installed in the production database server machine. From the menu select File->New->Project. Create a Java project called StoredProcedure. Switch to the Database perspective. Right click on the DB Servers view and select New Connection. Class Location: Make sure that the db2java.zip location is correct. Click on Finish. Next, right click on the connection name and select Import to Folder and choose the StoredProcedure Java project to import the definition to. 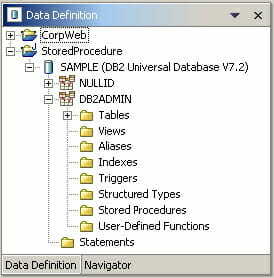 In the Data Definition view expand the database connection and the schema and view the Stored Procedures node. Right click on Stored Procedures and select New->Java Stored Procedure. In the Name field, enter GetManager and click on Next. In the Definition page accept the default and click on Next (this will cause the wizard to add sample database query code in the Java class). 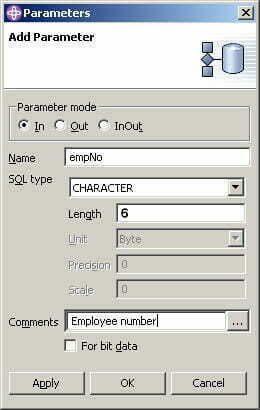 In the Parameters page click on Add and add the employee number input parameter as shown below. Click on Next. 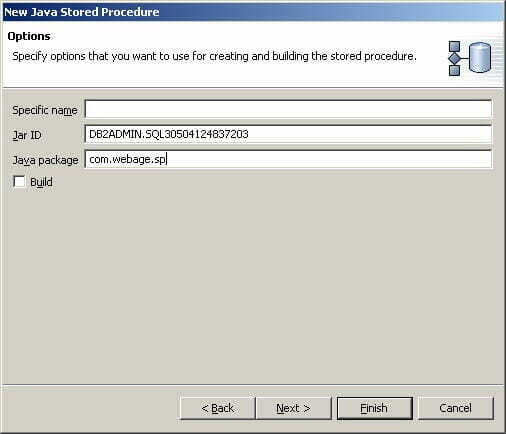 In the Options page, enter the Java package name as com.webage.sp. Double click on the GetManager stored procedure. 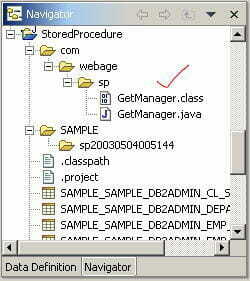 System will open GetManager.java. You will see an error message in the code – “The declared package does not match the expected package”. This is because WSAD adds the Java file to a wrong folder. To fix it, use a Navigator view and drag and drop the com folder directly under the StoredProcedure project. Note: You need to do this fix before you first build and install the stored procedure with DB2. Save the Java file and fix any compile problem. 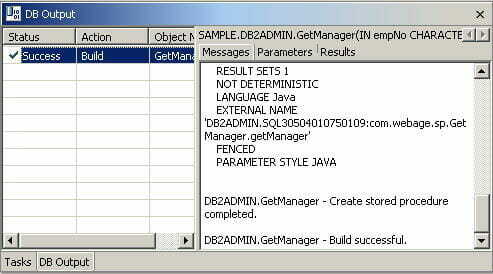 Right click on the GetManager stored procedure and select Build. Look at the DB2 Output view to make sure that there are no problems. Note: Every time you modify and compile the Java class, you must build the store procedure separately. 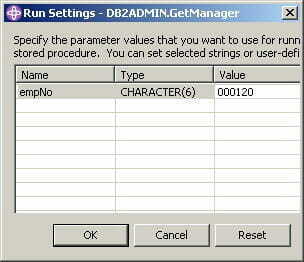 Right click on the GetManager stored procedure and select Run. Enter 000120 as the empNo input parameter. Click on OK. Check the DB Output view for the result.